Abdi Mohamed – On the evening of the 5th of April, many people patiently queued up to enter the City Academy‘s Fielden Theatre to attend the Bristol mayoral question time on race equality organised by Black South West Network (BSWN) and Up Our Street in association with BCfm Radio. The striking feature of the hustings was not about how the 250 capacity seated was filled, nor was it about the non-partisan organisers’ outstanding event planning skills and experience, nor was it about the eloquence of the chair, but it was about the quality of the questions and the answers given by the mayoral candidates. The prospective mayors tried their best to answer a range of questions about education, employment and housing, amongst many – vis-à-vis with tackling inequalities – apart from a very simple question about the single largest BME group in Bristol. Paul Saville, Independent: “I would introduce a direct democracy. For me the internet is a power … we can enhance the power of the internet; we can have referendums online: do you agree with resident parking zones? – for example. That will answer your question for the Somali community. “Analysing the responses given by the candidates, it is my assumption that [the mayoral] candidates underestimated and had no high expectations of what the Somali community could deliver given their background in Somalia,” Mr Abikar noted in an email interview. But the question we should be asking is there a ‘real diversity’ in the council offices? The answers given by the candidates were not, arguably, a true reflection of their ability and experience of working with or understanding of the Bristol Somalis. Indeed, the answers provided were a living testimony of how Bristol City Council has treated the Somali community over the years. Equalities data from the council shows that Somalis (estimated to be 10, 000 although local knowledge suggests they are more than twice of the estimated number) are the single largest BME group, yet they are the least engaged. They have generally been treated as an ‘invisible minority’. Chief among the factors that have contributed to this – in addition to institutional racism – is the way that the local authority collects data which does not provide full details of the social and economic needs of the community. Black and Minority Ethnic Voice and Influence Project report to BCC (2012) found, “[The] data categories do not fully reflect the diversity within the BME community … the Black African category is an oversimplification of the diverse groups that describe themselves as African for example the growing number of Somali people in Bristol.” These findings strongly indicate how the identity of the Somali community is being ‘concealed’ under different category. Consequently, it has created ‘a minority within a minority’ community. Thus Somalis are the least participated group, totally excluded from mainstream society. Bristol City Council, one of the largest employer in the city, had 8 Somali employees (in professional posts) in 2010 – that is almost 0.00% out of 16, 991 employees. Since then the situation remains the same, if not worse, according to anecdotal evidence. Moreover, at the present time it will be very difficult for the voluntary and community organisations to understand or question the local authority’s commitment to equalities. For example, regarding recruitment and retention, the council does no longer publish detailed breakdown of the ethnicity of its workforce – they just use the generic BME category to provide the number of people from minority ethnic communities employed by Bristol City Council. “The Council does need to examine its processes for collecting, collating and making use of relevant and appropriate data,” confides a council officer. Abdihakim Asir, a community activist, explains why these issues have rated high on the agenda of community concern and how can be addressed. He says, “The biggest obstacle is the lack of diversity plan to engage the community and the local authority’s unwillingness to promote positive action.” He also argues that the only way that these issues can be addressed is through the ballot box. “We must contact and meet all the main candidates, whether they are representing political parties or standing as independents, so as to understand their priority policies and how are they going to deal with specific community issues. Somali voters can, of course, not only influence the outcomes of the May 2016 local elections in Bristol. They can also influence the future direction of the city. This is the reason why politicians, particularly the leading mayoral candidates, have recently become more visible in inner city wards where Somalis concentrate. 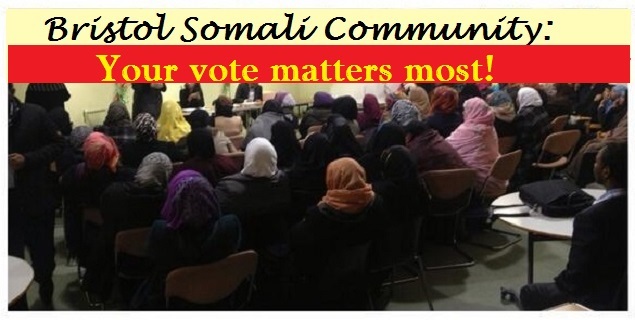 If the Somalis are to make sure that their contribution to the local economy be acknowledged and gain a recognised community voice, they should not ask what they need but they must demand what they want from the candidates – whether they are the mayoral, PCC and councillor candidates.